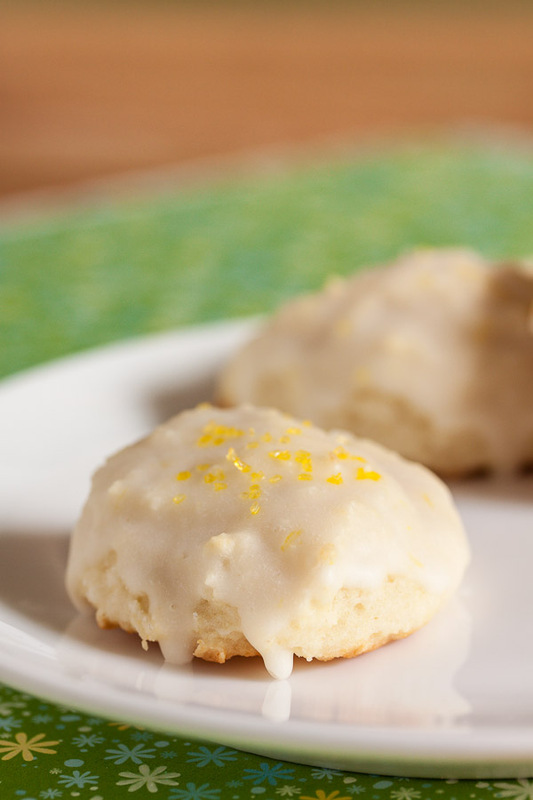 Lemon Glazed Ricotta Cookies | wanna come with? Oh look, lemon again. Have I mentioned that I love lemon? Once or twice? Sorry, I’ll try not to get stuck in a rut. 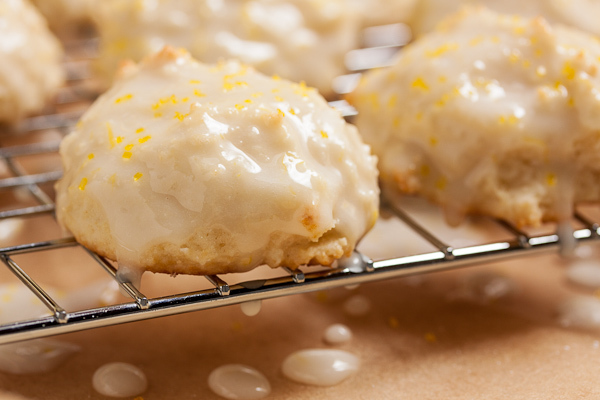 I initially saw this recipe when I picked out the orange cookie recipe a few weeks ago and was intrigued by the concept. I had no idea what a ricotta cookie might be like, but I imagined something with an almost cheesecake-y flavour and texture. The dough ends up being more like a thick cake batter than a cookie dough, which really shouldn’t have surprised me considering the mixing directions were also more like a cake recipe – with alternating dry and wet ingredients. And the final cookies? Like little dollops of cake. So fluffy. Little bite-sized clouds. I don’t think the ricotta adds any flavour (not that I noticed anyway), but a lot of moistness. Before glazing, these cookies have a fairly neutral flavour, but a nice sweetness. The cookies themselves don’t gain any colour and stay very pale, but the bottoms brown a bit. After glazing, they have a real punch of lemon. I actually ended up with way more glaze than I needed, so feel free to cut that part of the recipe by about half. And be careful when adding the liquids – it got thin really quickly. I ended up using only about half of the dairy specified and I think it could have cut that down even more and gone with a slightly thicker glaze. These are a HUGE hit with my coworkers. Compliments abound. 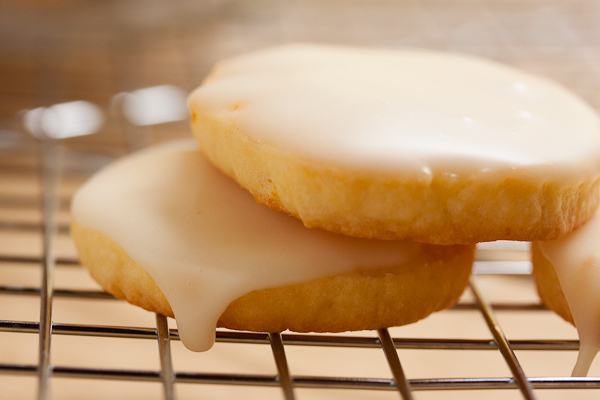 Everyone loves how soft and fluffy they are, and I got a request to put that lemon glaze on everything. One comment I overheard was “Oh my god, I have to leave here before I eat them all.” Of the cookies I’ve made so far, these are by far the most popular. 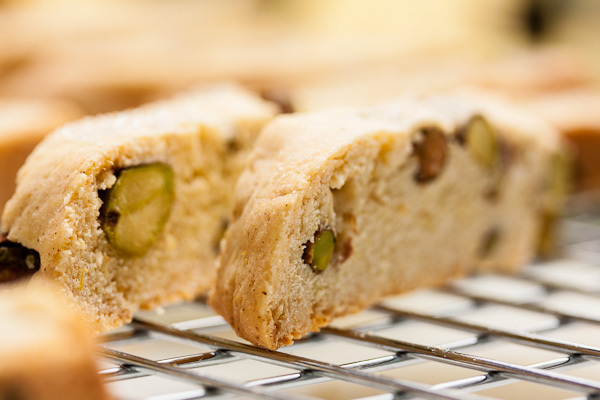 Adapted from Tracey Zabar's One Sweet Cookie, recipe by Dale Colantropo Fitzgerald. This is the second recipe I've tried from this book and they've both been delicious. 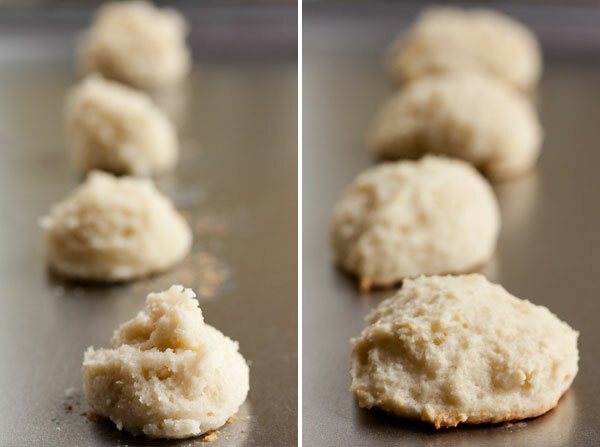 The photo of these cookies in the book shows them to be flatter and more spread out than what I ended up with. I'd be curious to hear how they turned out for anyone else. The recipe says it makes about 60 cookies, but I got 80. Edit – I've made these cookies again, and the second time they ended up looking much more like the photo in the book – no idea what I did differently. Combine the flours, baking powder and baking soda in a bowl and whisk together well. In another bowl, mix together the ricotta and vanilla. Set aside. In the bowl of a stand mixer fitted with a paddle attachment, cream together the butter and sugar until light and fluffy, about 4 minutes on medium speed. Add the eggs one at a time, mixing well after each. Turn the mixer down to low and alternate adding the flour mixture and the ricotta until combined. It will form a thick batter. Drop the batter by teaspoonfuls onto your baking sheet (I used a small scoop), allowing room for the cookies to spread (mine didn't spread much). Bake for about 8 minutes, rotating the pan halfway. Don't wait for the cookies to begin to colour – the bottoms will brown slightly, but the cookies themselves won't colour. 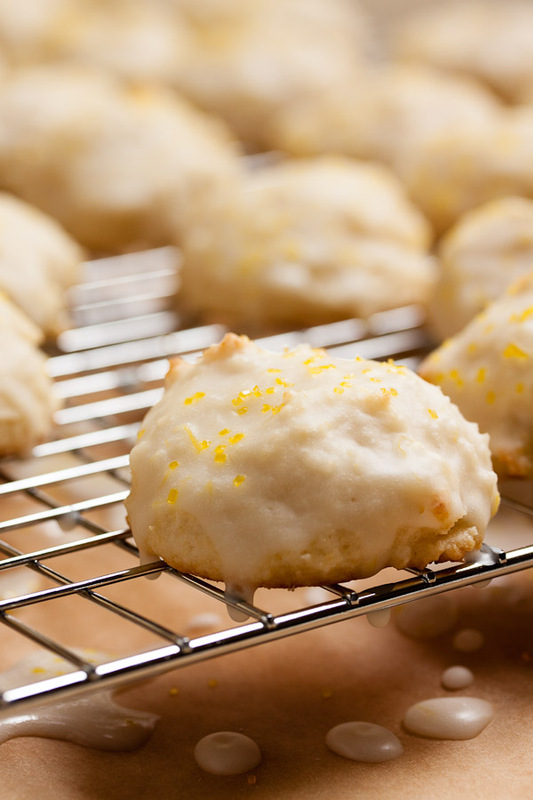 Allow the cookies to cool on a wire rack before removing from the baking pan. Allow to cool completely before glazing. Combine the sifted icing sugar, lemon juice, zest and flavouring (optional) in a bowl and whisk together. Slowly add the half and half until you get a nice thick glaze (you may not need to use all of the half and half specified). Dip the top of each cookie into the glaze and allow to dry on wire racks until the glaze has hardened. 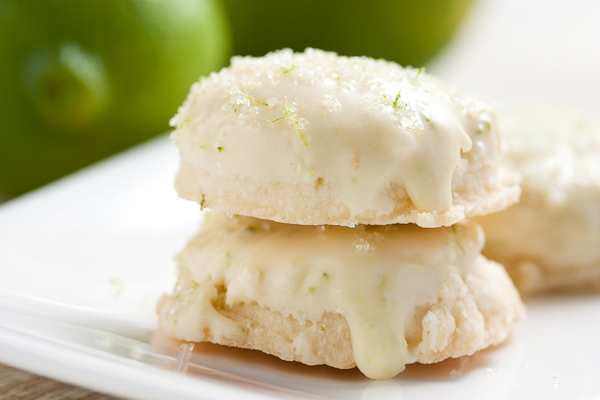 Instead of dipping, you could also spoon or pour a bit of the glaze over the cookies. Sprinkle with a bit of sanding sugar if desired. 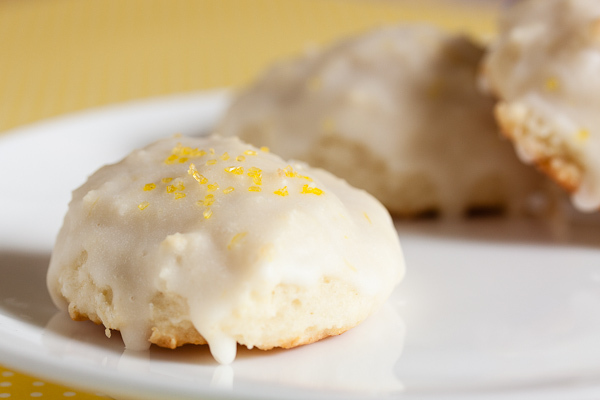 I love the sound of lemon and ricotta cookies, these look so delicious! Rosie, you should totally try it – they’re so good. Also, love the stuff on your blog – that strawberry ice cream is gorgeous! These got a thumbs up from my own personal chef at home, and my colleagues raved about them too! Hey sweetie! I’m so glad they worked out for you! !